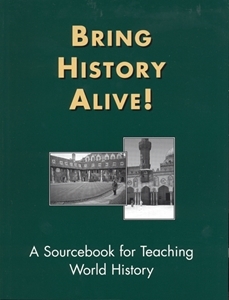 Bring History Alive!..A Sourcebook for Teaching World History: This sourcebook contains more than twelve hundred easy-to-follow and implement activities created and tested by veteran teachers from all over the country. The activities are arranged by grade level and are keyed to the revised National History Standards, so they can easily be matched to comparable state history standards. These two volumes offer teachers a treasury of ideas for bringing history alive in grades 5-12, carrying students far beyond their textbooks on active-learning voyages into the past while still meeting required learning content. Both volumes also incorporate the History Thinking Skills from the revised National History Standards resources that will help teachers enrich their classes with CD-ROMs, audio-visual material, primary sources, art and music, and various print materials.